Here’s a favorite recipe from the archives all prettied up for late spring and early summer. I love how nature looks out for chefs by readying ingredients that go well together at the same moment. 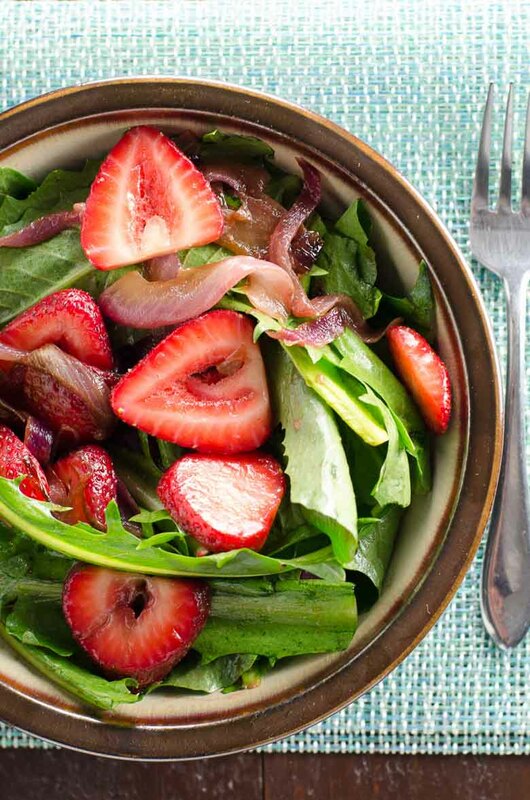 Dandelion greens and strawberries are a perfect example, and they’re helped along in this simple but succulent dandelion salad by a dose of slow-cooked red onions and balsamic vinegar. This vibrant spring salad is a simple, classic testament to the adage, "What grows together goes together." Growing up in suburban New Jersey, I thought of dandelions as free entertainment to be called upon when I’d used up all the blowing bubbles from the latest birthday party goodie bag. My parents thought of them as a lawn-yellowing nuisance and a prime target for a quick spritz of Roundup. We didn’t agree on much where dandelions were concerned, but we all knew one thing for sure. Dandelions were not a food. As you might imagine, the dandelions kept me pretty busy. But believe it or not, I managed to reserve some mental space to think about other important topics as well. Chief among them: the wide-eyed wanderlust of the young and closely guarded. It was almost hard to fathom what spectacular European city I’d settle in, what brilliant, far-flung company I’d keep, what pristine, cultivated vegetables I would perhaps deign to eat. Hard to fathom, indeed. Especially now, having recently returned to the New Jersey suburbs and—not even so recently anymore—discovered the distinctly uncultivated pleasures of eating dandelion greens in the springtime. Dandelion is among the more assertive of the bitter salad greens, but its fairly delicate shape and texture keep it friendlier than you might suspect. 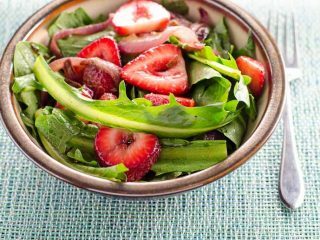 It pairs nicely with other strong flavors in different taste categories, such as salty and savory bacon or anchovy, or, as in this salad, sweet strawberries, caramelized onions and balsamic vinegar. Even when you buy dandelion in the supermarket, it tends to arrive with a goodly amount of soil still in tow, so be sure to wash it well. As with other such greens we’ll encounter as the season progresses, submerge and agitate them in several changes of water, then dry thoroughly. 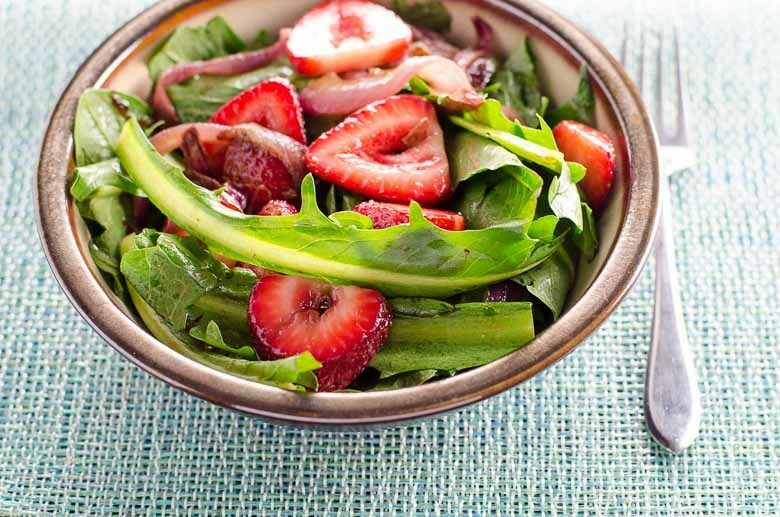 They say that what grows together goes together, and this vibrant spring dandelion salad with balsamic strawberries and onions is a simple, classic example of just how true that is. Warm the olive oil over medium heat in a 12-inch nonstick frying pan. Add the sliced onions along with a good pinch of salt. Cook, stirring often, until the onions are soft, lightly brown, and reduced to about 1/3 of their raw volume. You may need to reduce the heat gradually as the onions shrink. This process will take about 30 minutes. When the onions are nearly done, add the remaining 1 tablespoon + 2 teaspoons balsamic vinegar to the pan and continue cooking until it has thickened to coat the onions, a minute or two. Remove the onions from the heat and stir in the Dijon mustard. In a salad bowl, combine the greens, onions and strawberries with all their juices, scraping down the onion pan with a rubber spatula to incorporate all the oil and vinegar into the salad. Sprinkle with salt and pepper and toss.